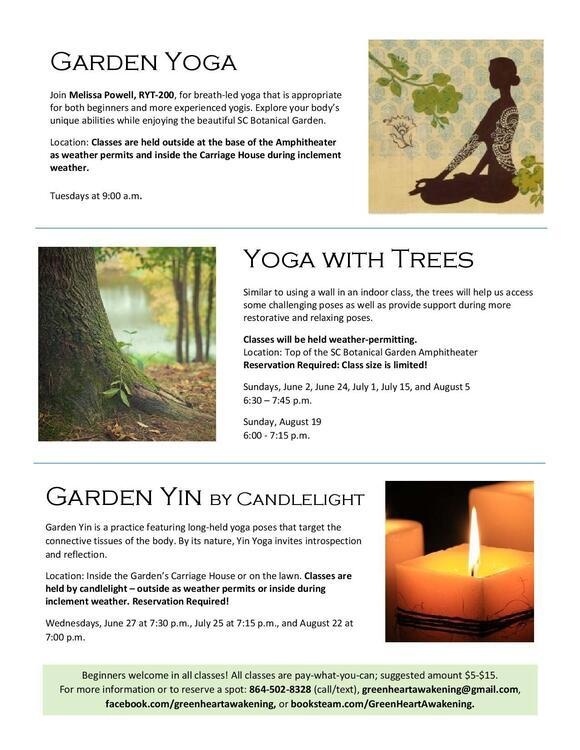 The community yoga class at the South Carolina Botanical Garden is a breath-led movement class, and all bodies and fitness levels are welcome. As TKV Desikachar said, "Anybody can breathe; therefore, anybody can practice yoga." Join Melissa Powell, RYT-200, for breath-led yoga that is appropriate for both beginners and more experienced yogis. Explore your body's unique abilities while enjoying the beautiful South Carolina Botanical Garden. A yoga mat and towel to place under the mat are recommended; although, a few mats are available to borrow. All other props, including blocks, blankets and yoga straps, are provided. Class is held outside as weather permits. Please dress accordingly in clothing that allows freedom of movement. During inclement weather, the class meets inside the Visitor's Center. When: Classes are held on Tuesdays from 9:00am to 10:15am. Where: Classes are held outside at the base of the South Carolina Botanical Garden amphitheater as weather permits and inside the Carriage House during inclement weather. Cost: Pay-what-you-can. Payment can be made at the Fran Hanson Visitor's Center. Register: Sign up by visiting www.booksteam.com/GreenHeartAwakening or by email at greenheartawakening@gmail.com. Pre-registration appreciated. Questions? Visit facebook.com/GreenHeartAwakening or contact Melissa at greenheartawakening@gmail.com or 864-502- 8328 (call/text).